When you walk into a room, it's usually easy to see what needs to be cleaned up. There's a pile of dirty laundry just waiting to be done; or the kitchen sink is piled with dirty dishes, pots and pans. But once the obvious things are cleaned away, do you forget about the rest of the room? Take a look at seven places you're forgetting to clean. When you look under a bed or sofa there are usually a few dust bunnies rolling around that can be quickly captured with a vacuum or dust mop. But did you take the time to look at the actual bottom of the furniture piece? You may be shocked at what you find clinging to bed frames, chair seats and table braces. Use your vacuum or a dusting wand to get rid of spider webs and eggs, dust and grime at least two times per year. Dust and grime can cling to vertical surfaces as well as horizontal ones. Open the curtains or blinds and turn on all the lights and you'll be amazed at how furry your walls may be. If you happen to have textured wallpaper, even more dust is lurking. Start at the top of the wall and work down using a duster that traps particles. Finish by cleaning away any stray marks or body soil that may be around light switches and door knobs. Finish your wall cleaning by paying attention to baseboards. An amazing amount of dust can collect on those tiny ledges. In rooms like kitchens and baths where there is more humidity, you'll probably need to wipe the baseboards down with a damp cloth because the moisture has turned the dust into soil that clings to the surface. When you're cleaning, take time to look up. You may see more dirt than you'll like. We tend to ignore what's beyond our plane of sight. 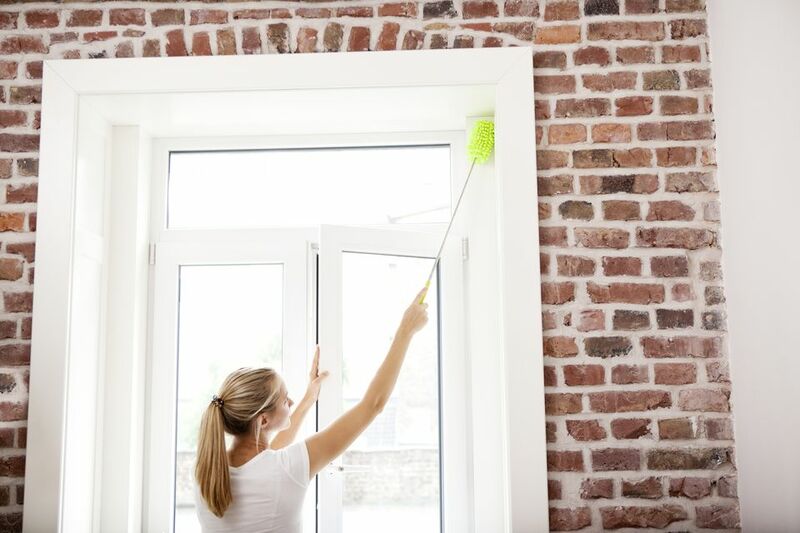 Routinely clean the top of door frames, kitchen and tall storage cabinets, picture frames and ceiling corners. While you're up there, check the light fixtures and ceiling fans. A disposable duster with an extendable handle is your best tool for capturing dust and spider webs. If you don't have one, use a clean microfiber cloth and secure it to a broom or mop handle with a rubber band. If your home has central heating or air, there is ductwork that connects the system to the living spaces of your home. The treated hot or cold air exits through vents and then returns to the air handling system. If the air returning to the system isn't filtered to trap dust and pollen particles, they will simply blow back into the living space. There are all types of filters, from very expensive hepa filters to inexpensive mesh. Whatever type you use, they must be changed or cleaned to be effective. While you're changing the filter, take time to clean the vent grates as well. You'll breathe easier and have less dust on everything. Be sure to treat single window unit filters and vents to a thorough cleaning, too. It's easy to see when a closet needs to be cleaned out. The clothes are crammed together, the shelves are piled high and things fall on you when you open the door. But when was the last time you cleaned the actual closet including the floor? Closet floors–especially if they are carpeted–can get really dusty and dirty from the outside soil brought in by shoes. The carpet can become a breeding ground for mold and mildew and insects like carpet beetles that then chow down on your favorite clothes. At least seasonally, pull everything out of closets and give the space a thorough cleaning. It's also the perfect time to weed out and donate all those things you don't really need and store the rest properly. If all of your cleaning tools are really dirty, then each time you use them you may just be spreading the dirt around. When was the last time you took a good long look at your vacuum, mop or scrubbing brushes? Of course, you empty the debris cup or toss out the disposable bag in your vacuum. But the cup should be washed and cleaned thoroughly every month or so. Most can be washed in hot, soapy water and allowed to air dry. There are probably filters that should be washed or changed as well. Check the rotary bars and brushes and remove any tangled strings or hair. You'll get better cleaning results and less dust. All mop heads, sponges and scrubbing brushes should be cleaned with hot water and a disinfectant cleaner after every use. Kitchen sponges can harbor and spread dangerous bacteria if not handled properly. Whether your indoor plants are real or silk, they can accumulate an amazing amount of dust. Most live plants will benefit from a quick trip under the shower head. If they are too large to move, use a microfiber cloth or disposable duster to wipe down each leaf. Silk plants can also be "dusted" with a cloth or by taking them outside and using a hair dryer set on cool to blow off the dust. To brighten individual stems of silk greenery or blossoms, place them in a paper bag with plenty of table salt or baking soda. Give the bag a good shake and much of the soil will remain in the salt or baking soda. Finish by dusting off any residue with a cool hair dryer before displaying.